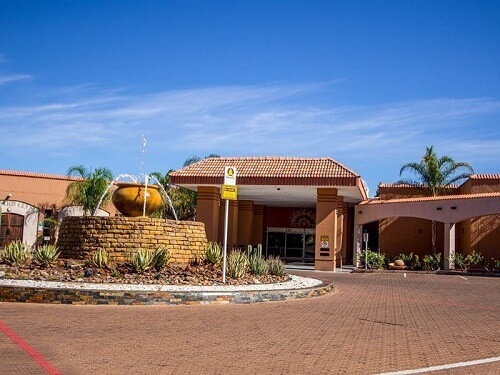 The desert Place Casino is located on Erf 1 Golf Course Rd, Keidebees, Upington. This casino is in the Northern Cape province of South Africa. Getting to its physical address is not that challenging. The casino is only a few kilometres away from the Central Business District of Upington. When you want relaxing real money casino gaming, this is the place to visit. Even though the atmosphere at the resort is liberating the casino gaming is action-packed. This creates for the perfect gambling getaway. This casino has top notch casino gaming services on offers. Desert Places casino boasts of 165 slot machines and 7 gaming tables on the casino floor. The games at the casinos are some of the top slots in SA. The gaming machines include slots, video slots and video poker. Table games at the casino are Blackjack, Roulette, Poker, and Texas Hold ’em Poker table have one table each. The casino floor has a full bar facility. The casino’s machines use the latest technology in coin-less systems. Players can use a variety bank cards (Visa and MasterCard) to play the games. This system of coin-less slot machines is faster and safer than having coins. Wagering starts from 5c to R5. This complex is a great place to hang out with the whole family relaxing during special family weekends. There is a special feature at the casino. It is a gaming arcade for the kids called Entratenga. At the casino complex, this is a place for the kids where they can be playing with toys, play stations amongst other kid entertaining activities. The casino resort is a 3-star hotel establishment. There is quality accommodation at the complex. Bella Roma Pizzeria and Grill is the main restaurant. This is one of the highly rated restaurants in the country. The restaurant can also be used to host events as it can accommodate a large number of people. For larger gatherings, the hotel has the perfect setup for conference meetings. The conference facility can hold more than a hundred delegates. There are also retail shops. You will be able to buy jewellery, clothing, toiletries, and other souvenirs after winning the jackpot. For more information on Northern Cape casinos, read our comprehensive guide.